A real all-rounder for professional filming. With it, you can record films in excellent quality and camera-shake is a part of the past. 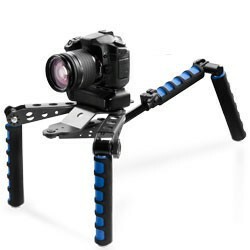 The rig can be used as a shoulder rig on the one hand, and as a steadycam on the other hand. With it, you can create shake-free recordings with digital DSLRs and camcorders, and keep an optimal body posture. Like this, there is a lot less post-processing work for you. The rig is also ideal for ground-level shooting. The rig is universally useable and can be adjusted to your individual needs with various joints and a pull-out shoulder pad. It can be pulled out via a telescopic extension. That way you can adjust the rig optimally to your height and work. Each of the joints comes with an internal thread. This allows the fixation of accessories such as, e.g., an external monitor for better judgment of the recording and sharpness, of video lights or an external microphone. The camera plate with a 1/4 inch thread is rubberized and the screw can be moved along the center line. Like this a shifting of the camera body is ruled out and the balance point can be adjusted individually to your camera model, ensuring stress-free working. The rig is made from sturdy aluminum and has a max. load capacity of approx. 9lbs. Therefore, it is also suitable for use with professional cameras with heavy lenses. To ensure a high wearing comfort, also when using heavy cameras and in the cold, the grips are surrounded by foam padding. As the rig consists of little segments, it can be folded to a very small transport size and fits into most camera bags and backpacks.